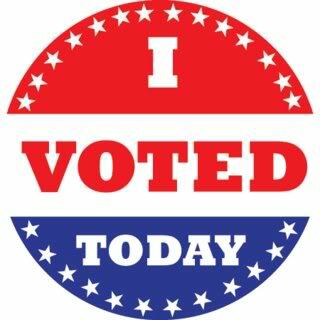 For me, voting is a complete privilege and an amazing freedom. It’s also a responsibility that I think we as free (as of now) Americans have to participate in order to keep our freedom. Most of the time when I hear about government, politics or campaigning, I don’t think of my simple vote as integral to the "pushing forth" of what I want to see. Yet, how can I not think that it is? If multitudes of people feel as I do, and I know they do, then we’re missing out on making a difference if we don't vote. However, plenty of people don’t feel this way. They’re disillusioned by the past (Nothing has changed, so why make the effort?) Some think voting is a waste of time (Hey, I’m just one vote. Big deal). But maybe that’s because they’re not passionate enough about their philosophy? Maybe they’re not passionate enough about having a voice because freedom doesn’t mean much to them anymore? Have we forgotten that we GET to have a voice here in the USA? Even if we don’t like any of the candidates, it doesn’t mean we can’t find a way to get a great candidate for the next election through our selection right now. By not voting, we’re letting other voters choose our future for us. Even if you think that’s fine and dandy today, what happens when you finally feel you need your voice heard? That door may already be closed. All I know is that in the past (I do absentee now), when I got to my polling place, I didn’t fear someone would bomb it. I didn’t fear that other people would shun me, come after me, hound me or shoot me, all because of how I voted. We still live in a place that allows major freedoms in our voting system. We get to vote --to choose --what we think is right for our country and not what a king dictates for us to choose as it once was for us, hundreds of years ago -- and unbelievably, still is in other parts of the world. Your freedom to vote is a luxury. If the government isn't to your liking, or even if it is, exercise your right to make a difference in whatever way you want. Do it for your fellow Americans. And most of all, do it for your own conscience and soul. I've never missed an election. Years ago, someone was complaining about the government. When I asked if she had voted, she told me no. I told her that in that case, I didn't want to hear what she had to say. I vote (in Canada though), last year, I even worked for Elections Canada accepting ballots and stuff. It was kind of fun. Sometimes though, even while I always vote... I don't want to vote for anyone because I don't like them! I wish we had the choice to vote No Confidence! Melissa, yeah, I know. I agree too. But when that's not an option, I have to vote for the better candidate even if I think he/she is still lame (just not as lame). If I don't, then I'll always wish the less-lame candidate was voted in instead of the REALLY lame one and realize I didn't help because I did nothing about it. If you want people to vote, tell them they can't. People don't realize what a precious privileged we have here. Whether or not our candidate wins, we are voicing our opinion, taking control of our country. One voice united with others can have a powerful impact, but sometimes one voice is enough.